This stand-alone OVA of Hunter x Hunter, which is the prologue of the 1999 television series, offers a little insight into Gon's childhood and why he decides to become a Hunter. 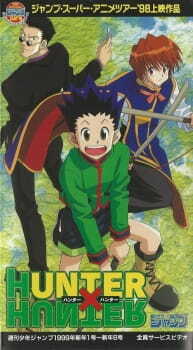 This OVA is a slight shift from the starting of the Hunter x Hunter series, where Gon, Kurapika and Leorio are on their way to become successful Hunters. While on their journey to give the Hunter Examination which is notorious for its low ratio success rate, the three characters are attacked by a giant octopus-type monster. This episode shows us the little fight that happens before the great adventure of the trio in the world of Hunter x Hunter begins. There's also a scene at the start of the episode where little Gon is saved by Kite as he's being attacked by a wild foxbear. Although it only lasts for a while, it was good to relive the moment that plays a pivotal role in the future Hunter x Hunter series. This episode came on 1998, before the production of the Hunter x Hunter TV show began so there's little I'll complain about the artwork which is below par, but watchable. The same applies for the background music, insert tunes and voice acting in this show. Although you won't miss out on anything important if you miss this OVA, but if you're planning on starting either the 1999 or 2011 TV series then this Pilot OVA is a good little watch. I'm gonna say this first off: don't even try to watch this unless you're a big fan of the series, whether it's the 1999 version, the 2011 version, or the manga. Why? Well, it's more of a 'fan's treasure' if you ask me. To begin with, the story is the same as the first episode the other two anime (I assume-- at this point, I have only see 2011, though I am planning on watching 1999 soon) but it takes it on in a different way, especially when compared to 2011. The story itself includes more daring escapades compared to 2011, along with more bravery and jarring events. The art, while grainy (it was another time when this was made) is well done and animated pretty smoothly. The sound was decent, with the voice actors doing a good job and the background music very fitting. The character, however, is what makes this a fan's gold mine. We see aspects of these characters we haven't seen before, whether it be Gon's selfishness that reminds others of his father, or perhaps Mito's annoyed love as Gon leaves just like Ging did, or even Leorio's rude comments and new badassery: this OVA covers a lot of things that 2011 didn't touch, making the characters more real, flawed, and deep, even just in half an hour. Overall, because of the characters especially (and also because I just love HxH) I enjoyed this a lot. So recently I’ve been watching the many versions of what’s often considered Togashi Yoshihiro’s greatest masterpiece: Hunter X Hunter. And so far, I’ve truly been enjoying myself. Without counting the currently ongoing Golden Wind anime, it’s the most fun I’ve had with a Shounen in a long time. So as such, I’ve decided to review each version after I finished watching them (Or in the Manga’s case, whenever it finally ends). So, to start off with let’s start with the second version of the story to ever be released: A pilot episode released in 1998, a whole year before the first anime series started and only a few months after the Manga started being released. So let’s see how this first attempt turned out. The pilot adapts the first two chapters of the manga (Which would be the first and third episodes of the 1999 Version and the first episode of the 2011 Version). Given that this is adapting so little, it stands to reason that this Pilot doesn’t have much going for it, if anything it’s kinda bare bones, which is its biggest issue. That said, I do feel there’s enough in this one episode to make it worth watching. Something I loved about this series is the feeling of adventure and the unknown, which this version flawlessly showcases, arguably even in a better way than all other versions did in their first episodes. We see Gon go through a challenge in it of itself to be allowed to leave the island, and then he goes off to meet new people and encounter strange creatures. Also, unlike the 2011 Version, it doesn’t forget that Kite (Or is it Kaito? I’ve honestly seen it spelled both ways) actually exists. His scene is also adapted well enough, you get the gist of him, what he means to Gon, and then he leaves. It’s not much, but its more or less the same as in the manga. Since this is only what should be a first episode, you get introduced to our main trio but not much else. This is fine, of course. All of these characters show that there’s more behind them than what they seem to have, and they all come off as likable. Gon is appropriately energetic, Kurapika is calm and sometimes cold, but also honorable and kindhearted, and Leorio is a total goofball. Again, not much here, but for what it’s worth, it does work. Overall this Episode looks okay. It’s looks better than the Manga version of these events for sure (Those early chapters looked as if they were barely finished) but unlike the other two Animes, nothing really stands out. It isn’t dark and almost gothic like the 1999 Version, nor is it bright and colourful to make the darker scenes hit harder like the 2011 Version. It tries to strike a balance, which honestly just makes this version blend in with all the other Shounen Animes. That said, this Pilot does include a giant kraken thing that I’m pretty sure never appears in the Manga but honestly I can totally buy as a Togashi creation. Similarly the soundtrack doesn’t really stand out. It’s not bad or anything, but there’s not much here either. It’s just sorta there for me. This is the first of our three casts, and I like it. Matsumoto Rica steps up as Gon and is the right level of childish and immature without getting annoying. Canna Nobutoshi was spot on as Leorio, being the right level of annoying while still greedy yet kind-hearted. Hidaka Noriko stands out as the least notable of the three. Not so much because she’s bad, but rather that she doesn’t really stand out. She’s definitely my least favorite of Kurapika’s three Seiyuus. To round of the rest of the cast, we have Okomura Akemi, Nakahara Shigeru and Utsumi Kenji (Who would ironically reprise his role in the 2011 Version). I know this review was short, but that’s because there just isn’t much to talk about here. Overall, it’s a fun pilot that isn’t anything special, but I do overall like it. I would’ve honestly liked to see how this version of the story continued, but as it is it’s perfectly fine. If you wanna give Hunter X Hunter a chance, then this is probably the best place to start.